Tallit Gadol – What is Tallit? The Tallit Gadol (or Jewish prayer shawl) is a square garment, made according to Jewish law. The talit has four wings; each wing has a tzitzis. In the Torah, HaShem commands men of the Jewish people to wear a garment with four wings, and four tzitzits, one tzitzit for each corner (wing). Based on the instructions in the Bible, this rectangular tallit comes with fringes that are attached to every corner of its four corners. These act as a reminder to the Jew about G-d and all His commandments. 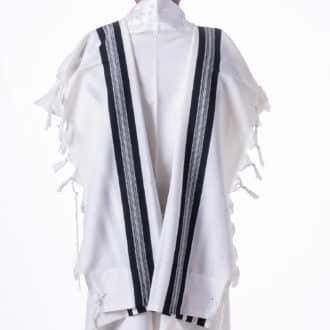 Tallit is often made of wool and is usually white that come with black stripes that run down two sides of the garment. Referred to as tzitzit in Hebrew, every fringe is made of 4 stands which are looped over to make eight strands entirely. The Tallit then draped over one’s shoulder just like a cape and with two corners on the front and two at the back of the wearer. What is the difference between a Tzitzis and a Tallit? The mitzvah of tzitzis divided into two parts: one is a tallit katan (small talliths), and the other is a talit gadol (big talit). 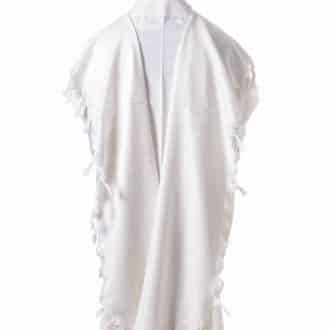 The prayer shawl we are presenting here is the tallit gadol. The tallis is worn exclusively by men and comes in a variety of colors and shapes. Technically, tallit must be worn throughout the day. However, that isn’t pragmatic in this day and age. Thus, another type of garment developed – the poncho-like piece of clothing worn under street clothing throughout the day. This piece of clothing is most generally known as tzitzit, but also called Arba kanfot, four corners or tallit katan or little tallit. Tallit is still being worn especially during morning prayer sessions, alongside tefillin, that Jewish men tend to wear during weekdays from 13 years old. The tallit is also worn throughout the day in Yom Kippur and numerous communities. The prayer leader or chazzan wears the tallit during different services too. In some communities in Eastern European, boys usually wear tallit katan in as early as three years old but only start wearing tallit gadol. Moreover, the large tallit regularly is worn after marriage. Western Europeans and Sephardic however, start wearing this much earlier. Men are the only ones required to wear such tallit. Why don’t Women wear Tallith? The reason why men only wear the Tallits (Jewish prayer shawl) is that women according to the Torah and Kabbalah more spiritually corrected than men, and the mitzvah of tzitzit is intended to fix men’s souls in a way that is, in women, already corrected. Why is the Tallit made of wool? The Torah instructs the Jewish people to wrap themselves in a tallith (tzitzit), and in the Oral Torah, The Shulchan Aruch says that it is preferable to wrap himself in a woolen Tallit. According to Halachah, it is good to use a prayer shawl made 100% of wool without any mixture of other fibers. When do you wear a tallit? The talit is worn almost always in the morning prayer (Shacharit prayer). The talit wore by men who have reached bar mitzvah age. The Ashkenazi Jews wear the Tallith only after they get married. There are special times when men wear a prayer shawl: during Yom Kippur (also at night time), during Mincha prayer during fasts, and of course, and also Hazzans. In antiquated times, the tallit has two sorts of threads connected to the edges or corners, blue and white wool. The blue wool known as the tekhelet was the symbol of nobility, and by the purpose of tallit’s and that is to remind the Jew that he is an individual from G d’s great kingdom of priests. The one of a kind blue dye was produced using the by-product of an ocean animal known as chalazion that lives in the Mediterranean Sea. Nonetheless, during the Talmudic period, as the core of Jewish life shifted from the Mediterranean Sea, tekhelet was outlawed and intensely taxed, it turns out to be rarer and completely disappeared eventually from tallit. Recently, there has been much theory concerning snail’s identity and the likelihood of reintroducing tekhelet. There are certain opinions today, some in certain Hasidic sects like Ruzhin, who believe that the biblical tekhelet found. You can see in the product pages the option of adding a light blue thread. For other opinions, such as that of Rabbi Mordechai Eliyahu (and others who follow the Zohar), it is forbidden to use tekhelet thread, because the Zohar says that the techeiles will not reveal until the coming of the Messiah, and therefore the thread of tekhelet today is not the original techeiles. The Torah commands them twice in regards to affixing fringes to their garments. First G-d advises Moses to command the children of Israel to make for themselves fringes on the sides of their clothing, all through their ages, and they must affix a tekhelet thread on the strings of each corner. This will be fringed especially for you, and when you see this, you’ll remember all of the L rd commandments and perform them, and you will not meander after your souls and your heart after which you’re going off to some faraway place. So to be able for you to recall and then perform all His commandments and you’ll be holy to Him. The knots and strings of the tallit are physical portrayals of the s 613 mitzvahs of Torah’. This works this way: Every letter in the Hebrew letters in order has a relating numerical value or gematria. The numerical values of the five letters that involve the Hebrew word tzitzit add up to a total of 600. Include the eight strings and the five knots of every tassel that totals to 613. Wearing tzitzit is an indication of real Jewish pride. Jews dependably have a means of dressing that set them apart from the general population of the land they lived in—even if this indicates exposing themselves to bigotry and danger. Through the grace of G-d, today the majority of individuals’ live in the lands where they are allowed to practice their religion without fears. These days, many also wear their Jewish uniform with great pride and with their heads high. Kabbalah instructs that tallit piece of clothing or garment that folds around wearers, is an allegory for G d’s limitless transcendent light. Those fridges insinuate the Divine light, which reaches out into and pervades each component of creations. By wearing the tallit gadol or the tallit katan, a Jew blends these two essential elements and makes them genuine in their life. These days, there are lots of beautifully and artistically designed tallit, and most of these are acceptable based on Jewish Law. Since there are many different laws involved in the creation of the tallit and tzitzit, these must be bought only from the trustworthy and g-d fearing vendor. Make sure that tallit made of quality wool and large enough to cover almost your entire body. Before purchasing a tallit, it helps to conduct your search before you come up with the final buying decision. Your knowledge matters for this can help you make an informed decision on what tallit to buy. You also need to find the best place to buy a tallit to ensure a satisfying purchase. Why are there different types of tallitot? There are other different types of tallitot, which customarily designed according to Chabad or Yemenite custom, and the rest of the prayer shawls are mainly the same, yet differ in color, and this is already a matter of character and personal taste. Why wear a tallit and tzitzit? Hashem, instructs us to wrap ourselves in tzitzis. Rashi says: Tzitzit is equivalent to all the mitzvot. Thus the person remembers his creator and does not sin against HaShem. We first recommend asking a rabbi; your rabbi will guide you if there is a kind of prayer shawl that you need to purchase. If the rabbi told you that you do not have a unique custom, you could buy any Tallith you wish. A tallith is a rectangular garment with four strands of tzitzit. Men wear the Tallit during prayers in the synagogue. 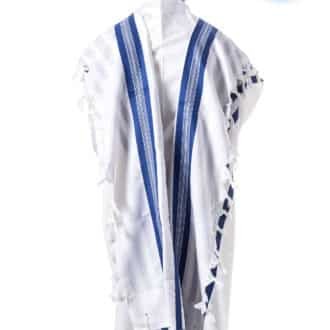 There is also a unique prayer shawl called “Tallit Katan,” which is worn regularly on the body, to fulfill the mitzvah of Tzitzit throughout the day. Halachically speaking, the tallit is a tashmish mitzvah. The Tallit is usually made from pure wool since according to the Shulchan Aruch, only a garment made of wool bound by the mitzvah of tzitzit from the Torah. The obligation to impose tzitzis on other clothes made of synthetic yarn, according to individual opinions, is only rabbinical. However, they make acrylic and silk tallitot. What is the purpose of the mitzvah of tzitzit? The purpose of the commandment, as reflected in the Torah, is to make a person remember all the mitzvot, and to distance him from giving up after the heart and the eyes, that is to keep him away from evil deeds. The Tallit isolates the worshiper from his surroundings and makes it easier for him to concentrate in prayer. In Ashkenazic communities, it is customary to wear a Tallit only after the wedding. The source of the tradition is the study of the juxtaposition of the parashiyot of ‘strands shall you make to’ and ‘that man shall take a woman.’ On the other hand, the Mishna Berura, which was adopted with great affection among most of the great Ashkenazi sages, came out against this custom and wrote that “it is a strange custom” as it says: “Until he married a woman, he would sit down and remove the matzot of Tzitzit?”, moreover, for this reason, the unmarried men wear a tallit katan. The tradition of the Sephardim is to wrap themselves in a talit from the Bar Mitzvah age and even before that. In the Yemenite communities, it is customary to wear a tallith from the age of education (age 5 or so). In Yemen itself all the Jews wrapped themselves in a prayer shawl all day long, while outside their home the Tallit was folded in a narrow fold and placed on their shoulders when they were there. In Israel, the custom wholly abolished. It is recommended first to measure the purchase of the Tallith, and thus to get ready to buy the new tallit. The origins of the Israeli flag drawn from two historical elements that emphasize an unbreakable bond: the tallit as the traditional symbol of the Jewish people, and the symbol of the Star of David – the symbol of Jewish tradition from the very beginning of its existence. Literal commandments included in the bible wasn’t to wear tallit but more on attaching tzitzit into the corners of the 4-cornered garments, which implies that these clothes are worn in by individuals during different events. 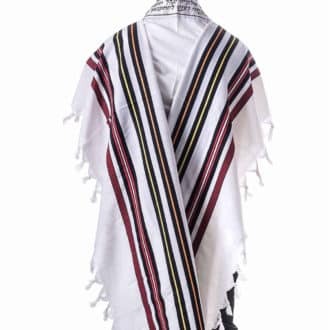 Classic and colorful in stripes, in silk or wool, the tallit is an essential piece for anybody who wishes to observe Judaism and follow the traditional Jewish life. 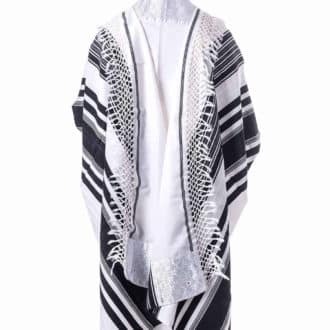 It’s a prayer shawl worn by Jews which comes with knitted and twined fringes that is also called “tzitzit” that are attached to each of the four corners. Now that you are already familiar with the definition of the tallit, you can now learn more about the reasons Jews wear this and also the difference between Sephardic and Ashkenazi tallit styles and the ways to wear it. Torah commands Jewish men to wear the Tzitzit in all 4-cornered garments that they wear during daytime. There is a paragraph in Torah which includes such command is read each morning as the third paragraph of Shema prayer. The tzitzit is a wool string that’s tied to each of the garment’s four corners. Based on the Jewish tradition, tzitzit comprised of 8 white strings on every corner tied with 5 knots. Though there is no command to wear this if one isn’t wearing a 4-cornered garment, the Jewish men always wear this four-cornered garment so these men can fulfill the mitzvah by wearing the Tzitzit. 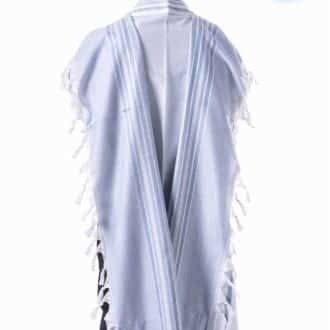 Kabbalah state that being wrapped in this four-cornered prayer shawl with the Tzitzit on it during praying time tends to arouse G-d’s mercy. For such particular reason, the Jewish Men wear the prayer shawl during morning prayers and Yom Kippur. Wearing tallit is significant because this acts as a reminder of the commandments of God. Anytime Jewish men see it, they will remind of their noble duty. Tallit Gadol is an ideal choice for morning services. Larger in size and crafted from silk or wool in white and with white, blue or black stripes, in the end, this must be worn over the shoulder. This smooth rectangular fabric was designed to display the Tzitzit. You’ll find this available in stunning decorations of embroidered scriptural bible scenes or known Jewish symbols like Star of David, Tree of Life or the pomegranates. The Tzitzit is worn as undergarment underneath the shirt. This doesn’t touch the body and mainly worn by the Orthodox men most of the time. Wearing the Tallit after the wedding is a common tradition in the Ashkenazi communities and Sephardic communities after Bar Mitzvah at age 13 years old when a Jewish boy comes to age. With the Talit with black stripes is a great choice within the Ashkenazi Jews. The white with the white stripes tallit is a top choice among the Sephardic Jews. While the tallitot are available in silk and other synthetic materials according to Halacha and the woolen tallit is Kosher for all events or occasions and will always remain a classic option. Tallis should be large enough to cover one’s shoulder and reach that person’s feet. Initially, it would help if you unfolded tallit and put this over your head, so this rest in and cover your shoulders in a way that it reveals its beauty and full size. Secondly, you must fold the edges just on the shoulder. The Atarah must face upwards and do not forget your Tallit player before putting your tallith on.